I won’t soon forget the moment when a character’s death occurred on stage and the audience took a breath, together, as one. The exquisitely timed music enhanced this moment, using its power to build the anticipation, lifting you with it, before erupting suddenly into a masterful symphony. As someone with little experience of opera, I might not be able to tell apart a ‘cadenza’ from a ‘coloratura’, but I recognised beautiful storytelling found in the emotions behind every action and every word. It is a tale of love, lust, jealousy, dishonesty and power. Floria Tosca is in love with the painter Mario Cavaradossi and when he is suspected of aiding a fugitive, she must decide the cost, demanded by the vicious Baron Scarpia, that she’d have to pay to save him. I walked into the theatre knowing next to nothing about the show (despite now realising it is a staple of the operatic repertoire, having been well-loved ever since it was first produced in January 1900). This was a decision I made to banish expectations and form an opinion based solely on what I saw that night. My only true anticipation was beautiful singing, which certainly did not disappoint. 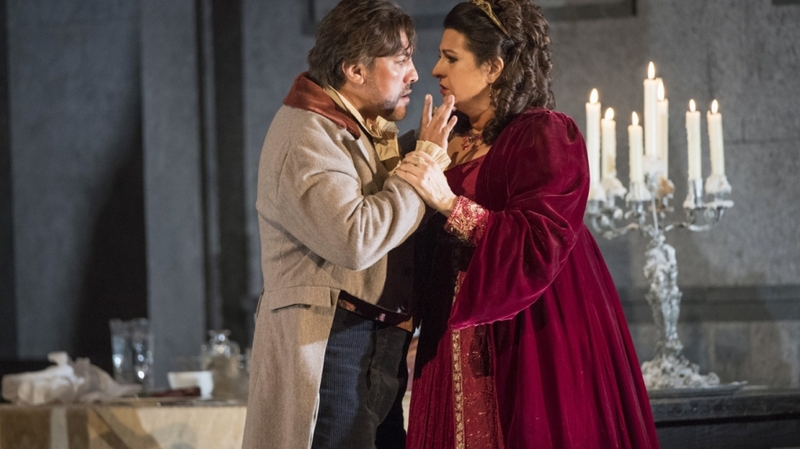 Claire Rutter, in the title role of Tosca, sang with power throughout her range in every line and with believably passionate drama. There is an element of Romeo and Juliet tragedy, weaved into her character’s story with lover Cavaradossi played by Hector Sandoval. With a strong stage presence and refined strength in his voice, there was great conflict between his character and that of Mark S Doss as malicious Chief of Police Scarpia. Portrayed with a depth combining elegance and brutality, a villain was created that had the audience booing and clapping harder than ever during the bows – one of the oldest but truest signs of an enthusiastic audience’s immersion. There were moments of strong chemistry between the three principals, with pivotal points given impact by the intensity of their acting. Before any of the lead characters had stepped on stage the music, played by the WNO orchestra and conducted by Carlo Rizzi. had already swiftly engrossed me in the story and it didn’t take long for the acceptance that I was no longer at the theatre, but in Rome during the Napoleon invasion. The pace gradually increased as anticipation built. That’s when I realised that I hadn’t been reading all the surtitles, my attention captivated by the scenes playing out below. Occasionally there was the moment of an empty stage or minimal movement, which provided the chance to take a closer look at the set designed by Ashey Martin-Davis. Tosca takes place in three precise locations, a different one during each act, and has a narrative concluded in less than twenty-four hours. The simplistic approach was effective in its ease to follow and the understated backdrops were a brilliant tool that assisted but didn’t distract from the main action being performed. Every word, every movement and every expression came together to tell a beautifully heart-breaking story of one woman’s quest to save her lover, the sacrifices he makes for his political beliefs and a man’s hate that threatens to devastate them. Told to delightfully colourful and all-encompassing music, it was a thrilling opera that has made me eager to see so many more in the future, particularly by the excellent Welsh National Opera.